"If the job's too tough for you to handle, you've got a job for me." Whatever your problem, he's the solution! 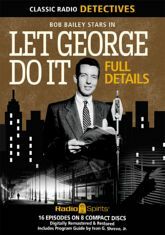 George Valentine is sardonic yet sympathetic as he solves mysteries, unravels crises, and gets to the bottom of whatever's complicating the lives of his paid-up clients. Bob Bailey made his first big impression on radio audiences in this series of tightly-packed, thought-provoking thrillers! Here are sixteen of his most fascinating exploits, with Virginia Gregg co-starring as Claire "Brooksie" Brooks.